Caravan Mini is portable music player that comes with features such as Bluetooth, USB, FM/AM and a collection of 351 Hindi songs. The pre-loaded songs on Mini are evergreen hits from legends like Lata Mangeshkar, Asha Bhosle, Mohd. Rafi, Kishore Kumar and Mukesh. You can enjoy your personal collection of songs on Mini speaker via Bluetooth or by plugging in your USB drive. With the option to tune into FM/AM stations, the Mini becomes the perfect all in one music player. The long lasting battery of upto 4 hours and the fact that the speakers are loud enough to fill your room will make Mini the envy of your friends. Warning, if someone steals it, we don't give a free replacement. Caravan Mini is portable music player that comes with features such as Bluetooth, USB, FM/AM and a collection of 351 Hindi songs. 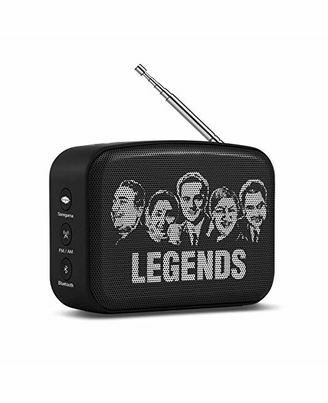 The pre-loaded songs on Mini are evergreen hits from legends like Lata Mangeshkar, Asha Bhosle, Mohd. Rafi, Kishore Kumar and Mukesh. You can enjoy your personal collection of songs on Mini speaker via Bluetooth or by plugging in your USB drive. With the option to tune into FM/AM stations, the Mini becomes the perfect all in one music player. The long lasting battery of upto 4 hours and the fact that the speakers are loud enough to fill your room will make Mini the envy of your friends. Warning, if someone steals it, we don't give a free replacement.